ホタルノヒカリ (Hotaru no Hikari) MV "SWEET" ver. He looks almost too good to be a convincing actor - but he's been using that to his advantage by choosing characters who are afflicted with perfectionist streaks. (He reminds me of Raito-Kun from the Deathnote Manga). He's the kind of actor who becomes his character psychologically. In every role he takes on, he emits this sense of cool confidence, tinged with just the right amount of vulnerability - he was like that in the Game, and he made Kou Kou Kyoushi a classy psychological/personal story, rather than the silly/overdone high school/teacher student romance it might have been. Great dramatic actor, great comedic one as well. Fujiki Naohito is such a wonderfully charismatic actor. I've enjoyed most of his dramas and his roles inevitably leave a deep impression - be it reporter (Suga Eiichiro), department boss (Takano Seiichi) or patissier (Ono Yusuke), he can play them all. No role is too big or small for him and I respect his dedication to his craft. Doesn't hurt that he's so very handsome! He's got such expressive eyes and can emote so well, which is something so lacking in younger actors these days. Fujiki's a great singer too! That he writes and composes his own songs has my utmost admiration. 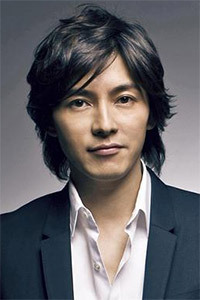 Fell instantly for Nao by seeing his profile picture here on jdorama! Turned out, he's an awesome person, on screen & off screen. I like how his real life seems to go very well, that's a rare quality in celebrities. He's a good actor, although he still has a certain signature style (that's totally Nao's) in all of his different roles, like the way he walks: a bit swinging (cute :3). Love him in Kou Kou Kyoushi 2003 & [email protected]! In most other dramas, he's too thin that his cheek is sunken. Eat more, Nao! I'm pretty sure it's his eyes. They're mesmerizing and I can get lost just staring into their depths...mmm...aHeM. So I digress, but you see what I mean? Naohito is a decent actor as well, as I've seen him pull off a variety of roles and honestly I would give anything he's in a try. Plus he sings well too, writes most of his own songs, is very intelligent, and is an all-around good and personable guy. He sets the bar for all other guys. His wife is so lucky! Cool aura, Mature, And always choose an intelligence character. But he can play other character too like Shinnosuke in gal cir and ryuji in GTO. The most impressive character from him are Azumi Shunsuke (Itoshi kimi E), Suga Eiichiro (Love Revolution), and Koga Ikumi (Kou kou kyoushi 2003). Especially "the Egoist" Koga Izumi, maybe sensei like that was terrible, but sensei are human too, he's done his job really well in that drama. As time goes by, I like him more and more ^^" He is sooo cute when he laughs, and those big eyes. He generally plays tormented characters, rough, not very my type of character, let's say. But still I like most of his doramas. His sweetest character role I've seen was in Itoshii kimi e (and Gal Circle, but that was a rather dorky one). And oh well, I still gotta see Hotaru no Hikari. Gosh, I just had to vote for this guy when I found out that he acted in GTO as the friend cop, whom I HAD NO IDEA was Naohita until I checked his dramography. Naohita certainly has great potential as a versatile actor, although he is often casted as a cool, collected hottie. Sorry to sound superficial, but he's really cute! And newly married. Alas! He's got it all. Really smart guy from a top university, plus a model, actor, singer, guitar player.... he just does it all ! (Is he good at sports?) Yet he seems humble. I've seen him so many times (gyarusa, Ichi Ritoru no Namida, Slow Dance, GTO, Nanisama, Hana Yori Dango (old one)) and he's the perfect superior, nice, intelligent, good looking guy. Finally in gyarusa he proved his ability to act funyn too. His acting just touches my heart, even if his character is absolutely hateful at the beginning, I would end up loving him by the end. He always portray his characters so well that he manages to make me smile and cry at the same time! This is my No 2!!!... I think he is the most handsome that i ever come across.. I notice him in some very old show.. cannot remember the title already. He can singing very well too.. and has a few singles and albums already! I first noticed him in "Antique" in a mysterious character. I was shocked after seeing him in GTO. The characters he played are so different! He is a versatile actor. His role in "Kou Kou Kyoushi 2003" was simply perfect. I like Fujiki Naohito because he's very quite and not really in the public eye much. The fact that he's such an great actor just adds to his appeal. I've liked all of his dramas so far, so I can't help liking the guy. Fall for him in Love Revolution... great looks, charming and gentle looking, and great acting on top of that!! Wonder where have I been before... will go hunting for his other movies!!! He is the very embodiment of the word 'charming'. In Itoshi Kimi e, he substantiates his chivalrous looks with a stirring and vulnerable portrayal of a man who's about to go blind. If you look up the definition of "gorgeous," his picture would be there. He's absolutely handsome. Also an incredible actor. In every role he makes you love him. Wow, I'm in awe. He's got such a beautiful voice... apart from his great look! Every single of his dorama I watched were awesomely entertaining. There's definitely something special about him. His charms are mysterious and he has the most gorgeous smiles ever. Even at mid thirties, he manage to sweep me off the grd with his mesmerizing ways. A real good singer too! I first got to know him in Love Revolution and was immediately attracted to his dashing look and excellant talent!! He is really a extremly talented actor and singer!! He gets my vote because he�Ls one of the hardworking guys. Not all his dramas are good, he plays sometimes bland characters, but he has a certain softness that I like.